There’s something about Jel Suarez’s work that elevates it from mere appropriation into something else entirely. They are fitting depictions of Suarez’s imagination, experiences, and her thoughts. 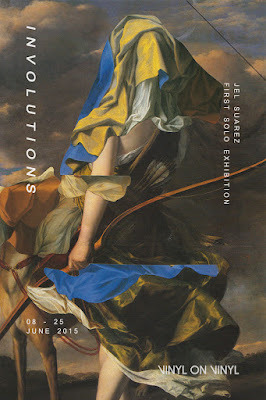 With “Involutions”, Suarez’s first solo exhibition, she has prepared her most ambitious set of works yet. After all, “involution” by definition could refer to intricacy and complexity. Every piece found in this collection is mesmerizing in their complexity, not only visually but also in their message. The surreal imagery is not only the product of the repurposing of the source material, but also of deconstructing and reconstructing them. It’s a classic example of making something new out of seemingly disconnected images, but in her pieces, there is an evident sense of mystery and wonder that goes with it, producing surrealist art at its most effective. The seemingly repetitive images almost form a dream-like tableau, a skewed depiction of a world both familiar but also jarringly different. With “Involutions”, Jel Suarez has given us a glimpse into her world: a world where classic art is turned on its head and the grotesque, the surreal, and the absurd are commonplace. There is a narrative that exists in all of her works, and “Involutions” is but the latest chapter in this narrative. It is also a waypoint in her artistic journey, showcasing her growth as an artist. Appropriating and deconstructing image as a form of art may have been done before, but not with the same level of care and thought that Suarez puts into her work. While this is her first solo exhibition, there’s a confidence to Suarez’s work that should put people on notice. For Jel Suarez, art is a means for her to release all her frustrations and anxieties. And to that end, “Involutions” is akin to an exorcism in collage form.